Hello there, bit of a belated announcement! We are over the moon to be releasing this super 8 track mini album from everyones favourite racket Castrovalva on 4th May. We will be taking Preorders from Wednesday 1st April. All 8 tracks will be available for the measly sum for 5! Bargainous. Youll also get a lovely digipak with bonus art for your money. The album will also be available from the usual download channels. Get yourself over to Castrovalva (NEW SONG UP) on MySpace Music - Free Streaming MP3s, Pictures & Music Downloads where you can here the beautiful My Father Bleeds History. Donk. 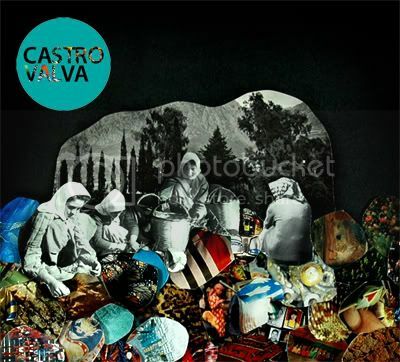 This release sees Castrovalva harness their powerful sound and drive it into harsh improvisational bass-driven progressive rock reminiscent of influences such as Lightning Bolt, Xbxrx, Hella, Arab on radar, DFA 1979 & Oxes. Recorded by Ross Halden At Ghost Town Studios (Forward Russia!, Sky Larkin, Rolo Tomassi etc), the S/T Mini Album was written in the space of a week with the recording of Dream Carpet completely improvised during the one take recording process. Castrovalva will now play a few selected dates across the UK ending at The Brudenell Social Club, Leeds on 21st March 2009 supporting Nadja. For more information and posters head over to Castrovalva (NEW SONG UP) on MySpace Music - Free Streaming MP3s, Pictures & Music Downloads. The band will then begin working on the recording of their next vinyl release which is due in October 2009 Another tour is planned for May and will see the band supporting artists such as Zach Hill. Pre-orders also receive a free live CD.